After 15 years of American League dominance, the Senior Circuit might have found sustainable success. Washington Nationals pitcher Max Scherzer. 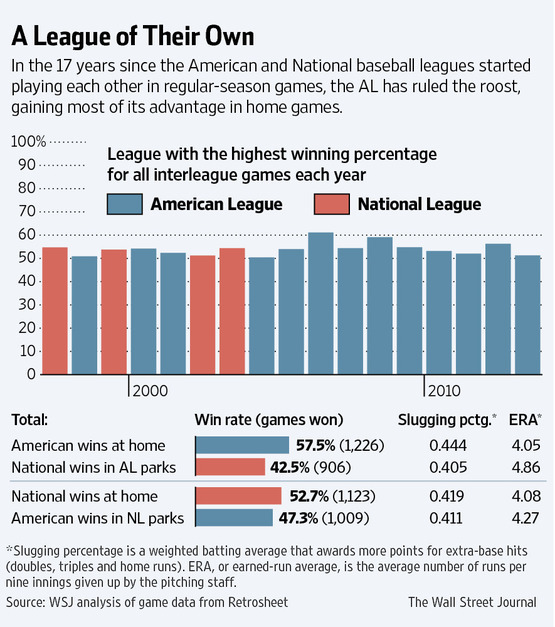 For all the talk about conference imbalance in the NBA, basketball isn’t the only pro sport in which one half of the league usually dominates the other.1 Since baseball’s Interleague play was introduced in 1997, it has largely served as an excuse for the American League to show its superiority: The AL went into the 2018 season having run up a 1,503-1,257 record on the National League in interleague play over the previous decade. How good is that? If the average AL team were playing a 162-game season against its NL counterpart over that span, it would win 88 games — roughly good enough to make the playoffs in the NL most seasons. Why the big disparity? For one thing, the AL has typically had more star power: In the past decade, eight of the top 10 players in baseball according to wins above replacement2 (Mike Trout, Adrian Beltre, Zack Greinke, Robinson Cano, Miguel Cabrera, Justin Verlander, Evan Longoria and Dustin Pedroia) spent time in the AL, while only three (Clayton Kershaw, Joey Votto and Greinke) played in the NL.3 The rule difference that grants AL teams a designated hitter at home also helped them rack up a big home-field advantage over the years. But so far in 2018, the AL’s edge has eroded. After about a month and a half, NL teams are 32-18 against their AL foes, outscoring them 242-208. If this holds, it would be the first time the NL has won interleague play since the 2003 season. Obviously, it’s still early. But even if we limit ourselves to the first 50 interleague games of each season (to make an apples-to-apples comparison with 2018), this is the NL’s best record in interleague play ever, supplanting its 31-19 start in 1999. Back then, the NL was competitive — it ended up winning almost 54 percent of its games against the AL that year. This season might bring a long-awaited return to its old form. Some of the reasons for the change were emerging last year. The DH just isn’t the advantage it used to be; so far this season, AL designated hitters have an on-base plus slugging (OPS) of only .725, their worst mark in nearly three decades. Perhaps that’s why AL teams are just 6-19 (a miserable .240 winning percentage) at home against the NL this year, a complete reversal of the trend that used to fuel American League dominance. The specter of tanking also applies here. Of the nine teams tracking for at least 88 losses in FiveThirtyEight’s MLB prediction model, six (the White Sox, Royals, Orioles, Tigers, Rangers and Rays) are in the AL. 4 Meanwhile, some of the most improved teams in the majors (such as the Braves, Phillies and Pirates) are in the NL, along with a group of already solid teams who got better over the offseason (the Diamondbacks, Cardinals and Brewers). Although the AL still has the advantage in top-line talent — only one of this year’s top 10 in WAR (Nationals ace Max Scherzer) is in the NL — things appear to have tilted in the NL’s favor overall. 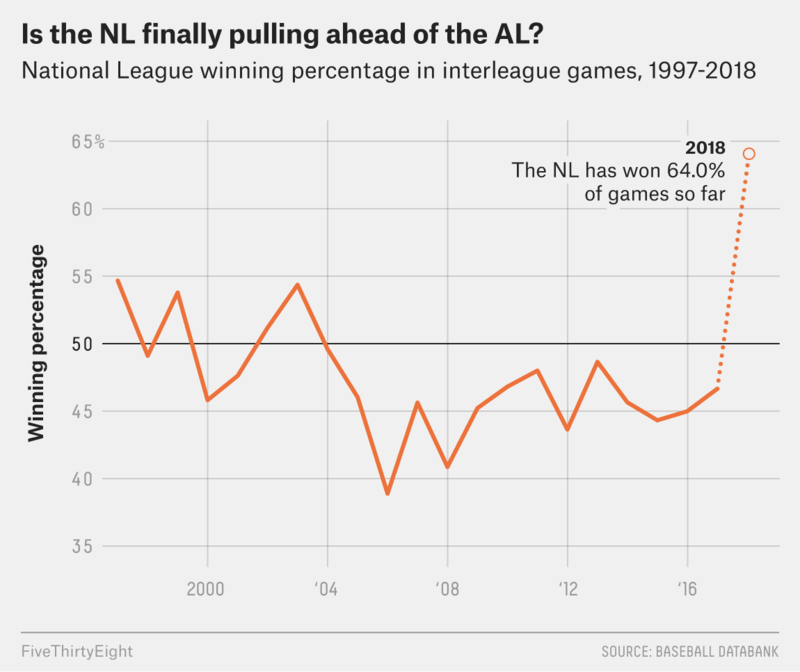 It’s worth noting that the NL has gotten off to a hot start before, only to crash and burn by year’s end: In 2016, it won 30 of the first 50 interleague games… then promptly went 105-145 the rest of the way. So we could end up looking back and thinking how cute it was that the NL had such a large early edge on its AL rivals. But at least there are some reasons to think this year is different, and that the NL’s newfound success is sustainable. And the West does dominate in the NBA. Even after a rocky start, it ended up winning the NBA’s interconference battle for the ninth straight season in 2017-18, 221-199. Using an average of the WAR versions found at Baseball-Reference and FanGraphs. You can extend this further down the list if you want: 13 of the top 15 played in the AL, versus just six in the NL, and so forth. After Tampa Bay at 88 losses, the next-losingest predicted record belongs to the Oakland Athletics (84 losses), a big gap that probably can serve as the de facto barrier between tankers and simply mediocre ballclubs.